Why did Stalin create a Jewish state in the distant reaches of Siberia? In the 1920s, Joseph Stalin supported giving Soviet Jews their own homeland. The Jewish Autonomous Region, however, turned out to be a failure, in large part because it’s located in one of the most remote areas in the Far East. Nevertheless, it still exists today, even though Jews comprise only about 1 percent of the population. 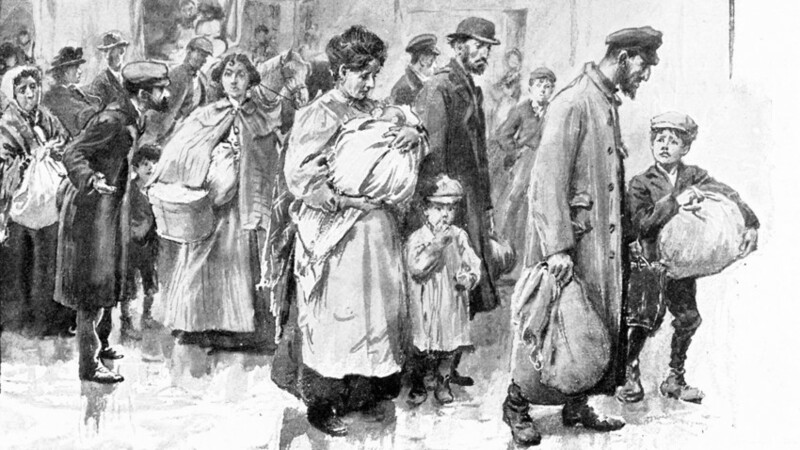 The early 20th century was a tough time for Russian Jews, who were allowed to live only within the Pale of Settlement and often faced violent pogroms. For instance, around 800 people were killed in 1905 during attacks related to political unrest. The Pale of Settlement was abolished after the February Revolution in 1917, but like all other nationalities the Jews suffered horrendously during the Civil War (1918 – 1921) when military factions from all sides robbed, harassed and murdered with impunity. As many as 200,000 Jews were killed during the Civil War, according to statistics. When peace returned and Soviet power solidified, the government began to wonder – how to handle “the Jewish question”? 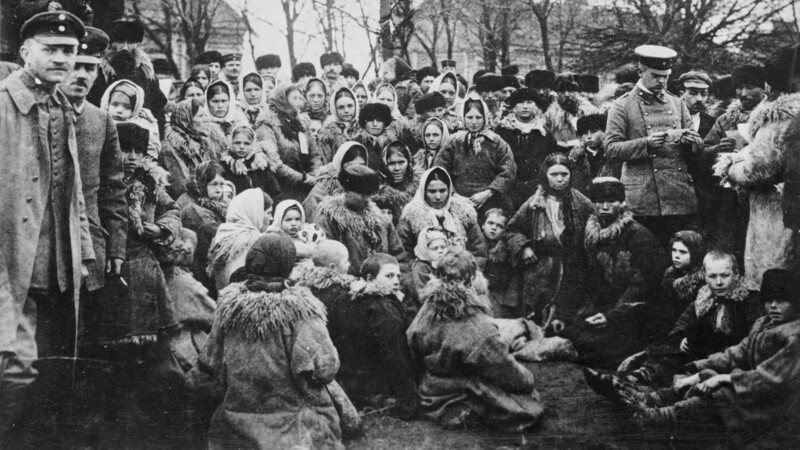 Crowd of the Jewish refugees in the open air in Russia. One of the three uniformed officials with them is examining their papers. Joseph Stalin, who concentrated power in his hands in 1924, was reported by some people to be a Judeophobe. Nevertheless, he strongly denied such claims and called anti-Semitism “a remnant of cannibalism.” Still, he felt that something had to be done with Soviet Jews. After the October Revolution, commerce and small-time craftsmanship (the main occupations of Jews) were negatively viewed for class reasons. So, the government planned to turn Jews into peasants. Stalin was eager to make the dispersed Jewish population live in a clearly defined territory and to give them national autonomy, something which many other Soviet nationalities also had. Apart from helping to solve domestic issues, the creation of a special “socialist Zionism” for Soviet Jews would also help Moscow compete with the Zionist project to Palestine that was gaining momentum at this time. But where to put this Soviet “Promised Land”? The first option emerged in 1926 when Moscow announced support for a Jewish autonomous region in the Crimea, whereby about 96,000 Jewish families would move there. The project gained an international dimension when in 1929 the USSR signed an agreement with the American Jewish Joint Distribution Committee, a Jewish relief organization based in New York. It gave $1.5 million a year to finance “Crimean California” and Jewish resettlement to the region. The USSR started to equip communes in Crimea for Jews to live in. It started well: several communes were created and worked effectively planting seeds and developing cattle breeding. However, problems soon emerged: local groups, who were envious of the well-financed Crimean Jews, started pogroms and created serious unrest in the peninsula. 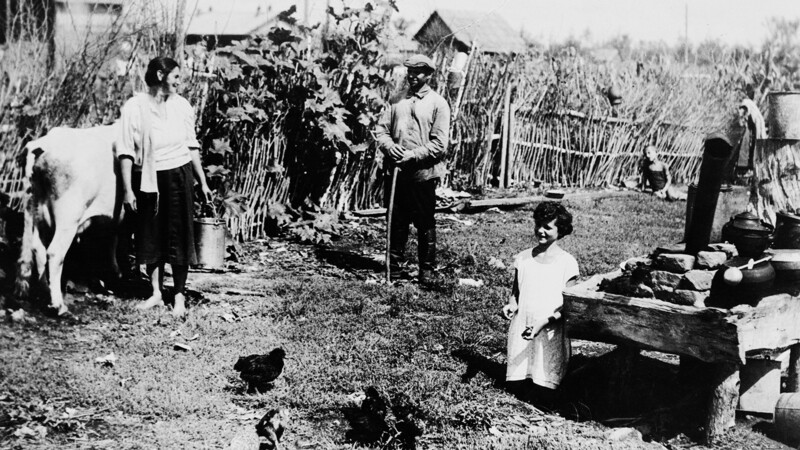 The Jewish family of Gefens in their homestead land in Birobidzhan in the Jewish Autonomous Region of the USSR. Jewish settlers began to come to this region in 1928. Dissatisfied, Stalin slowly shut down “Crimean California,” and devised a new plan: move the Jews to remote areas in Siberia where there was plenty of land and no reason to fight. In 1928, the first Jewish families started to move to the Amur River basin, in the vicinity of a small village, Tikhonkaya (literally “Quiet one”). Gradually, it transformed into the city of Birobidzhan (6,000 km east of Moscow), and it became the capital of the Jewish Autonomous Region. Official Soviet Jewish magazines published poems and tales dedicated to this region, which would become known as “the Soviet Palestine,” a long-awaited homeland for a landless people. This project for giving land to Soviet Jews, however, didn’t go much further than hanging signs in Yiddish alongside Russian ones. The journey to Birobidzhan was extremely long and arduous, and resettlement was poorly organized. The region’s status was also unclear: it was not a republic, but merely an “autonomous region” with uncertain privileges within the Khabarovsk Region. Then, in 1935 Stalin decided not to grant real autonomy to the region, leaving Soviet Jews without statehood. Also, Stalin was not willing to let Jews from abroad move there, even in the 1930s when many were trying to escape European countries threatened by the Nazis. Moreover, the Soviet leader executed many of the region’s Jewish officials both before and after World War II. 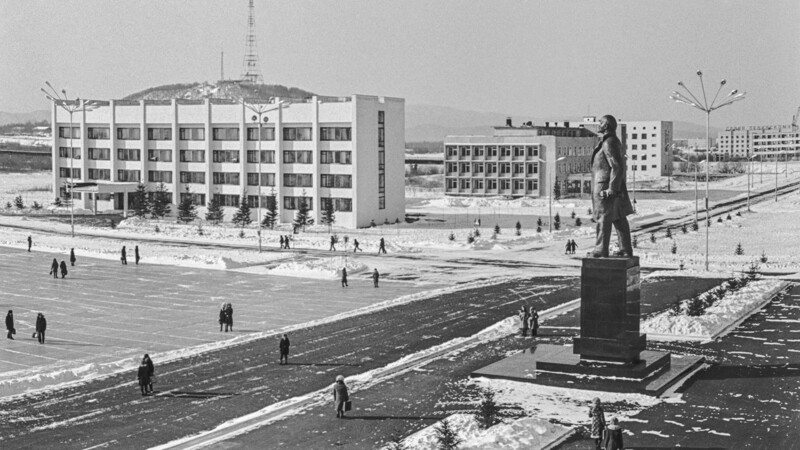 Lenin's square in Birobidzhan, the times of the USSR. With the founding of the state of Israel in 1948, Jews had a much more attractive place to move to than a remote region in north Asia. Soon after its creation, Israel became the USSR’s adversary, so Stalin became skeptical of helping the Jews. “Stalin himself ruined the Jewish Autonomous Region as a national hearth [of the Jewish people],” Valery Gurevich, a regional historian concluded in his book on the region’s history. The Jewish Autonomous Region still exists, and Birobidzhan today has a population of about 75,000. According to the 2010 census, Jews make up only 1 percent of the population. Almost 90 years after the idea was hatched, it’s clear that plans for a “Far East Palestine” have failed.